A report from JP Morgan Chase Institute (JPMorgan is part of a new healthcare venture announced with Amazon and Berkshire Hathaway) notes that many Americans wait for their tax refund to make payments against medical bills. 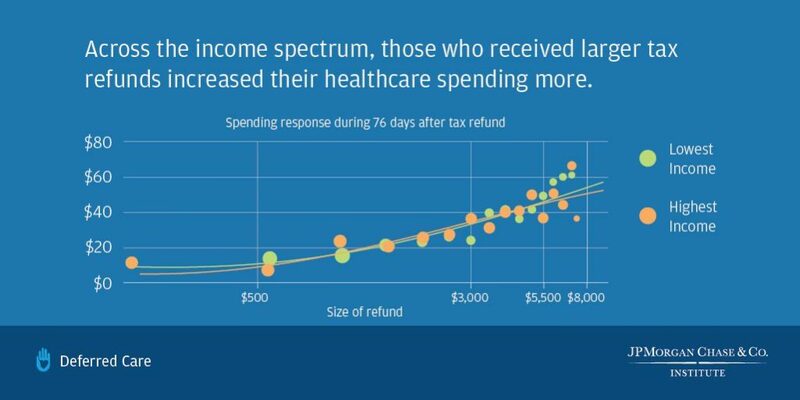 The report looked at 1.2 million American households in different income and demographic groups that received tax refunds in 2016, and found the 60% increase is linked primarily to people that had been putting off payments until they received their refund. Researchers found it to be a common approach among younger people, women and people with lower income. However, scheduling healthcare payments around tax refunds every spring could jeopardize Americans’ financial health, Diana Farrell, president and CEO of JPMorgan Chase Institute, wrote in CNN Money. “It also poses problems for Americans’ physical health, because those who rely on this cash infusion to afford health care are likely to delay care,” she warns. One possible solution suggested is periodic refund payments that would disperse returns throughout the year to prevent consumers from postponing dental visits, hospital visits, and in-person doctor appointments until the spring tax season. Additional flexibility could prevent consumers from putting off necessary care. Meanwhile, patients’ out-of-pocket spending continues to grow as they take on more responsibility for the cost of their medical care. Average out-of-pocket costs rose 11% from $1,630 in the fourth quarter of 2016 to $1,813 in the fourth quarter of 2017, according to a recent TransUnion Healthcare analysis. At the same time, more Americans fear paying for their medical bills than becoming seriously ill.
For anyone involved in healthcare payments and the emerging “healthcare consumerism model,” these sorts of payment “blips” are going to be important to monitor.